Back in my home,this is a regular tea time snack,but i’ve seen families serving this for breakfast along with Fish molly ,spicy curries ,stews etc. Soak the rice in water for 5-6 hours and drain it. 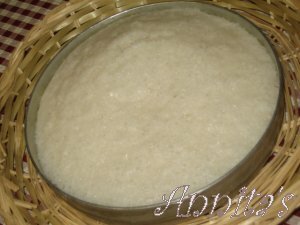 Grind this with grated coconut,sugar and cooked rice adding just enough water to a smooth batter.Be careful while adding water,the batter should not be very watery,it has to be in the consistency of idly batter.Add the yeast and salt and mix well together.Cover it with a lid and keep it in a warm place for 8 – 10 hrs to ferment. Just before preparing,check for the sugar and also add cardamom powder if you’re using it.Gently stir it and keep it aside.Grease a flat pan or idly mould with little oil and spoon in the fermented batter.Top it with cashews and raisins. Steam it for 15 mts in a medium heat or until it is done. Allow it to cool in the pan for 20 mts and gently take it out . Tip :- For soft vattayappams,carefully spoon only the foamy part from the top of the fermented batter into the pan.Stir the rest of the batter well and again allow it to ferment.With 20- 25 mts,it will ferment again and you’ll get a foamy batter on top. 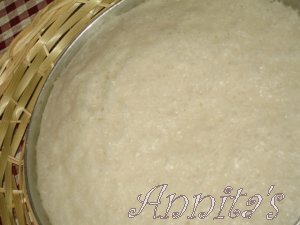 Update :- Instead of sugar,you can also use jaggery.Just heat the jaggery adding little amount of water and allow it to melt completly.Pour it through a sieve and collect the melted jaggery in a bowl.Allow it to cool and then add it to the batter .Again be careful about the consistency of the batter,it should be similar to idly batter. This entry was posted on July 15, 2008 at 4:48 pm	and is filed under Breakfast Dishes, Lil' Milan's Choice, Snacks & Appetizers, Traditional Kerala Dishes. You can follow any responses to this entry through the RSS 2.0 feed. You can leave a response, or trackback from your own site. Great post annita.. it looks Yummy!! when i was a kid, we had a maid called shantha who used to make the best vattayappams in the whole world! mom fired her cuz she used to steal :D but i still cant forget the taste of her vattayappams! instead of steaming it, i usually micro wave it. abt 10 mins in the oven in a greased dish. makes the job far more easier. You will not believe I was craving to have this recepie for a long time and I am going to make it tomorrow itself.Thanks a lot and I believe it will turn out to be good when I make it . Its a very simnple recipe,Sajna..You’ll surely get it right..
I’m always learning something new from you. Nice to see you back!! I tried your gulab jamun recipe and it was delicious. Thanks for a wonderful and easy recipe. Please keep many such awesome recipes coming!! Back to your blog after a long time. You are still doing a wonderful job on your blog! Keep up the good work! 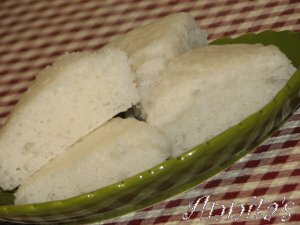 hi anitha,i was also looking for this recipe..thanks dear for sharing this…today i am going to try this…i love ur blog…has lots and lots of recipes with prefect description! keep going..
Can we use the same batter for making appams. 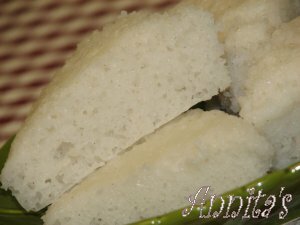 Yes pintoo,but u hae to make the batter little thinner for appams..
today i was in a mood to make a cake..and i gave in google vanitha pachakam, as i like most of the recipies in it very much..thus i came to saw ur blog.. its coooollll,superb..and after reading this vattayappam recipe,’m rushing to do it..
wow! this sounds easier to do. I’ve heard of vattayappams but never knew how to make it….I’ll have to give it a try. thanks for the recipe. I had eaten this dish in a friend’s place& liked it very much,I did not know the name of this dish too,but iv’e been wanting to make this so badly as it was a new one for tamilians like me. Thank you dear.Try it out and lemme know your comments too.. 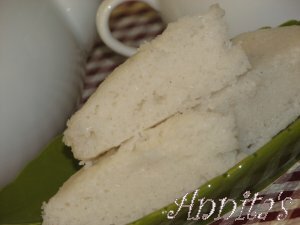 The tips which you had given for Vattayappam is really good and it does work well..Thanks for the tips.. Thanks annita for the recipe.. I made both vattayappam and appam. They taste great. I shared with my mom and some of my friends too..
I’m so happy to hear that Pintoo…Thank u very much for letting me know abt it. welcome back.awesome recipe. my hubby and kids loved it.i used to eat this as a kid at my neighbours house but that aunty would never part/share her recipe. now many thanks to u i can make as much as i want without her help.thanks a lot. Thank you very much,r.I’m so happy to hear it..
Annita, thanks for the wonderful recipe..Can long grain rice be used for this? Great recipe.I tried it yesterday and it came out really good.It tasted better than store bought vattayappams. Everyone loved it.Thanks a lot . You have an amazing website and I am sure you are a great cook too!! Love your recipes..
Few months back you had a recipe on Fish Molly .. Have you taken that off?? is it a sweet dish? with out sugar how it tastes? tried ur recipe..came out well..thanks to u.. Please post the recipe for kerala wine. the one which is made with variety of fruits by boiling. i love them. just heard they r made with fruits. could never follow the recipe. please post……………. Just happened to see your blog & looks very interesting….cant wait to try these recipes…shall let you know .Mini. 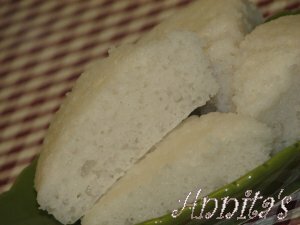 Hi Anitha, i tried this Vattayappam recipe of urs and it turned out to be owesome. My hunnby is very specific abt food and he praised me like anything for preparing Vattapappam. This was the first time am prepared a Kerala dish. Thanks a lot for the recipe. thanks for the recipe anitha,can we make this in the oven. Yum! thank you for this wonderful recipe, Anitha. I love vattayappam!! I can’t wait to eat it tomorrow! Real taste of vatteppam was adulterated, since it was commercialized by bakeries in kerala. 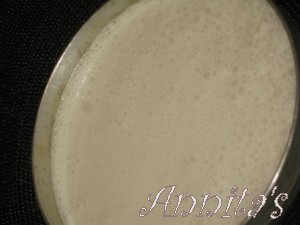 Real vatteppam was made out from soaked rice, fresh sherred coconut, suger and fresh toddy. other spices deviates the taste from the original taste. It is to be steam cooked. How to get vivika in white color? Great Dish yar Remembering my mums…………. THANK YOU FOR YOUR RECIPE………. Hi Betty, Yes you can pick whatever paint color you want, it just has to be FLAT finish paint. No eggshell, gloss, etc And the you add the chalk powder to turn it into chalk paint. What kind of raw rice did you use?Is it Basmati,long grain rice matta rice or idli rice.Please let me know because I am planning to make this for easter.Thanks in advance.